An especially open layout and volume ceilings enhance the living space of this small Craftsman design. The dining area accesses the screen porch with summer kitchen, ideal for outdoor entertaining. The master suite features a dramatic tray ceiling, access to the covered back porch, two walk-in closets with pocket doors, and a roomy master bath. Extra storage space can be found throughout with linen closets, a walk-in pantry, and two storage areas in the garage. 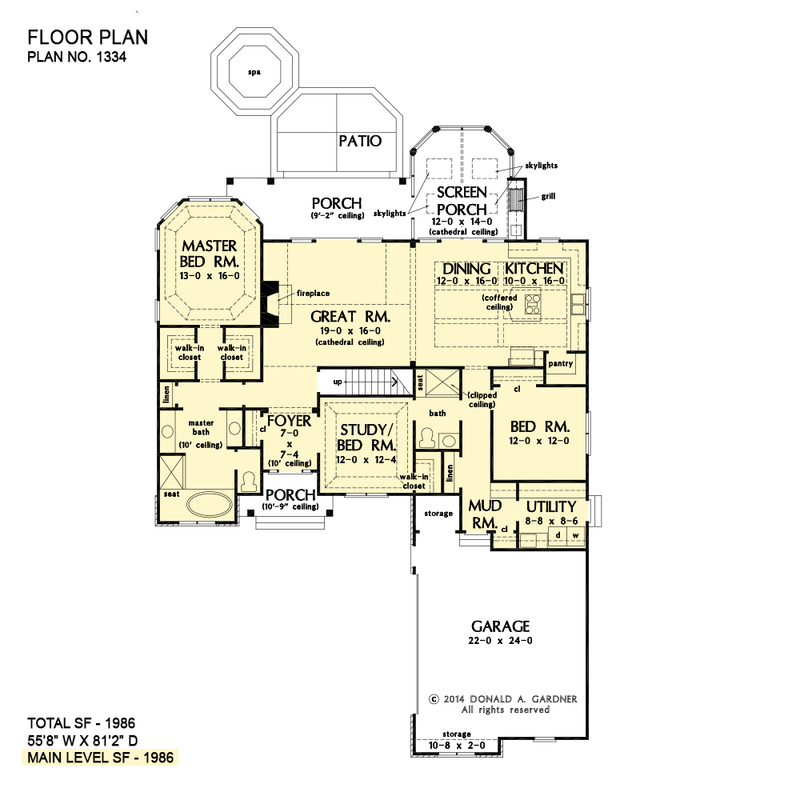 1st Floor: 1986 Sq. Ft.
Porch - Front: 54 Sq. Ft.
Porch - Rear: 170 Sq. Ft.
Porch - Screened: 199 Sq. Ft. 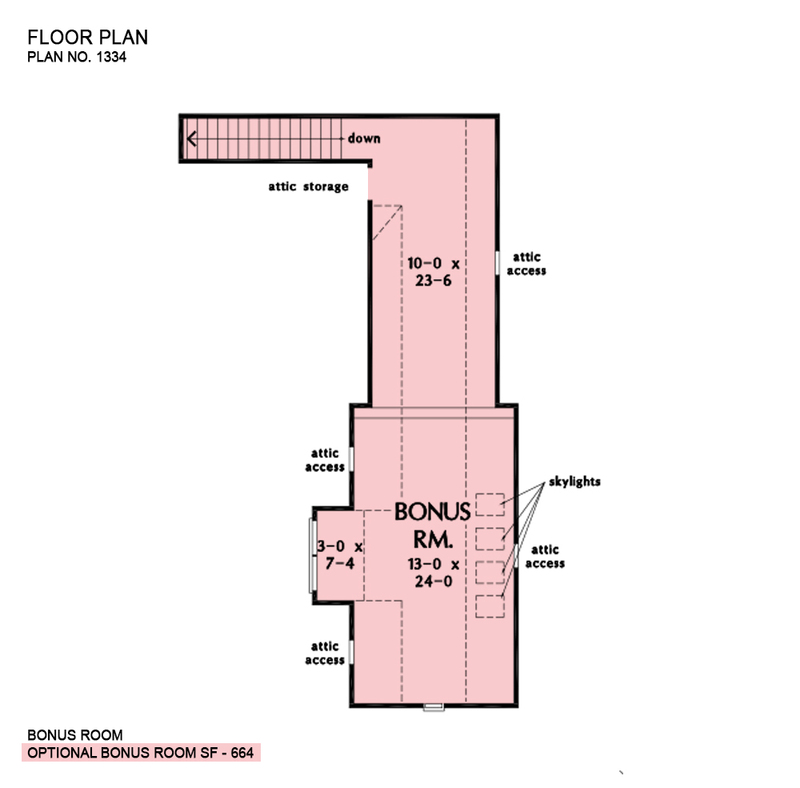 Bonus Room: 664 Sq. 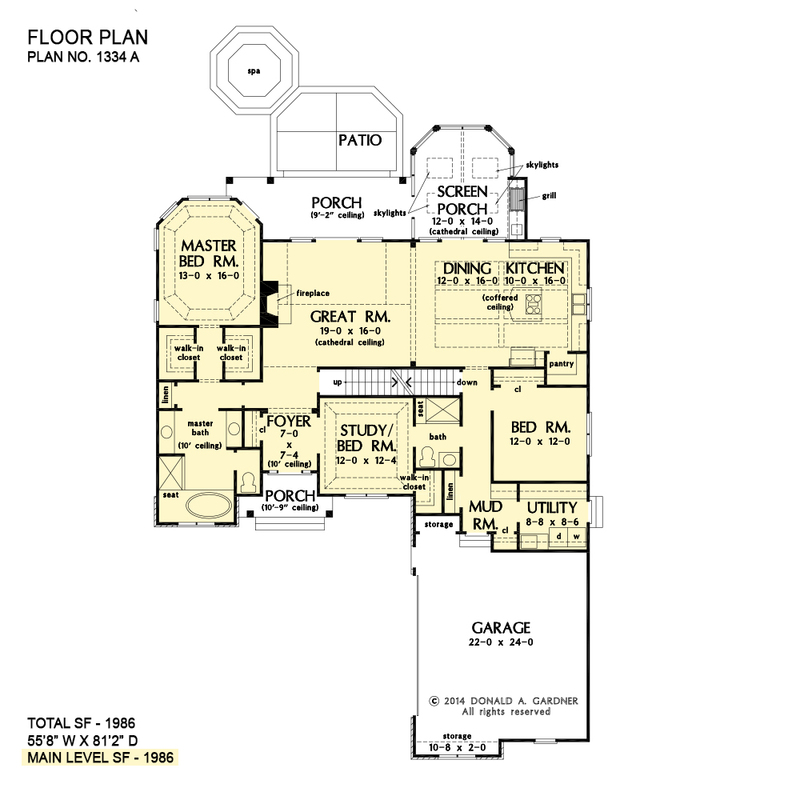 Ft.
House Dimensions: 55' 8" x 81' 2"
Master Bedroom: 13' 0" x 16' 0"
Mud Room (Flat): 7' 0" x 6' 2" x 9' 0"
Foyer (Flat): 7' 0" x 7' 4" x 10' 0"
Dining Room (Coffered): 12' 0" x 16' 0" x 10' 6"
Great Room (Cathedral): 19' 0" x 16' 0" x 16' 2"
Kitchen (Coffered): 10' 0" x 16' 0" x 10' 6"
Utility Room (Flat): 8' 8" x 8' 6" x 9' 0"
Bonus Room (Clipped): 13' 0" x 24' 0" x 9' 0"
Garage (Flat): 22' 0" x 24' 0" x 0' 0"
Garage Storage (Flat): 5' 8" x 4' 6" x 0' 0"
Master Bedroom (Tray): 13' 0" x 16' 0" x 10' 6"
Bedroom / Study (Tray): 12' 0" x 12' 4" x 11' 6"
Bedroom #3 (Flat): 12' 0" x 12' 0" x 9' 0"
Porch - Front (Flat): 7' 0" x 5' 8" x 10' 9"
Porch - Rear (Flat): 23' 8" x 8' 0" x 9' 2"
Deck / Patio (None): 17' 0" x 11' 8" x 0' 0"
Porch - Screen (Cathedral): 12' 0" x 14' 0" x 16' 4"
Garage Storage Bay (Flat): 10' 8" x 2' 0" x 0' 0"